Computerized digital charge control, user-friendly numeric display, seven selectable preset programs for popular battery types, amp manager and equalization functions. 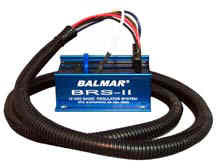 Optional Battery and Alternator temperature sensors available. 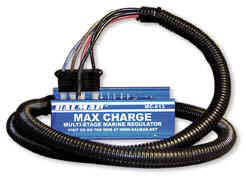 Digital charge control, equalization function, preset programs for most popular marine battery types, including flooded, gel and AGM. 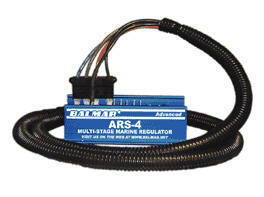 Optional Alternator temperature sensor available. Simple single stage charge controller. We have been working with solar energy & battery systems since 1969... Over Four Decades. · We are a full service company. We want a real person to consult with you because, we want to be sure that you don't waste your time and money and that you buy only what you need. · We strongly recommend that you talk with us first about your solar power needs. Please use our expertise as a resource. We have been working with solar energy & battery systems since 1969... Almost a Half Century of Experience. Our 47th Anniversary!! If you think you find a better price anywhere, call us before you buy. PLEASE NOTE: Hours, Monday thru Friday 9:00 AM to 7:00 PM Central Time. Except as otherwise noted, the text and graphics provided on our web site are copyrighted by The Solar Biz Inc. or its licensors. Material on this site is intended for your personal use only. The Solar Biz Inc. does, however, permit visitors to make a single copy of the information published on The Solar Biz Inc. web site for their personal, non-commercial use or use within the organization that employs them. Pursuant to the Digital Millennium Copyright Act of 1998, use of this web-site’s unique copyright protected intellectual property or Registered Trademarks, without prior written permission, for any purpose including but not limited to advertising, promotion or sale of products or services, for business or private financial gain, any commercial advantage, or the enhancement of competing websites, or any other marketing media, constitutes an act of willful copyright infringement.